EDI files can be received in a variety of ways. On way is to sign up with a VAN, a Value Added Network. 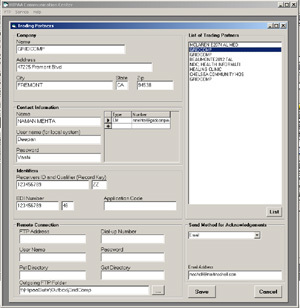 Typically a payer or provider signs up with such a VAN and sets up on the VAN's server a mail box for incoming and outgoing EDI files. Another way is to set up an FTP (File Transfer Protocol) server locally and allow trading partners to deposit their files in an inbox and to remove files destined for them from an outbox folder. This approach gives great independence and it is very cost effective. A third way of exchanging EDI files is through email attachments. Email has many advantages. It is ubiquitous and simple. Encryption and data security solutions are widely available. 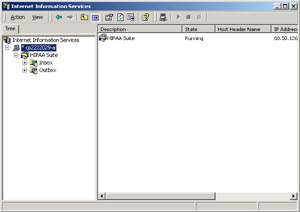 Routing parameters are not important, the email is send straight to its destination. 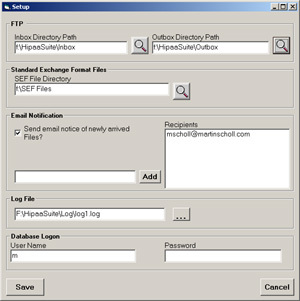 Through FTP an EDI file or many EDI files are deposited by trading partners in the Inbox. HIPAA Communication Center scans the Inbox every minute. If files are detected, those files are then analyzed. 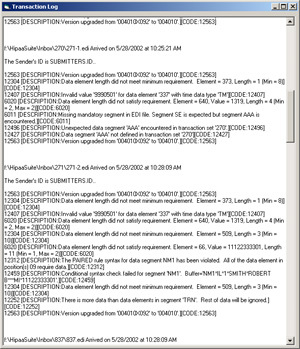 The sending trading partner is detected and the rules for the partner are loaded. A 997 EDI acknowledgement file is then produced and send back to the trading partner. Warning of EDI errors are also generated and send back. A log file with time and date of receipt and those warnings is created. Staff at the office receives an email message with the basic information of the new file. The file is moved to a specific directory for further processing. 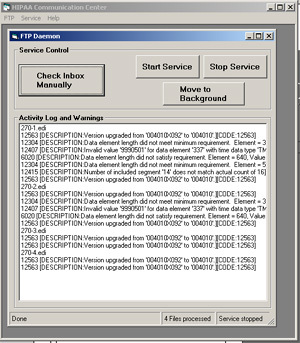 A log on all the processed files and the results of the anaylsis are kept and displayed through the following screen.